Welcome to Stokes & Gonzalez, P.A. Someone’s life can be changed in a second due to someone else’s careless actions. Each year thousands of adults and children are injured through no fault of their own. We, at Stokes & Gonzalez, P.A., assist these individuals in obtaining justice and rightful compensation. We specialize in Personal Injury and Maritime Litigation. With over 45 years in combined experience, Mark L. Stokes and Jacinto J. Gonzalez, both Martindale Hubbel AV rated attorneys, will fight for your rights if you are injured due to someone else’s negligence. We will work with you, and for you, in obtaining just compensation for your injuries and in holding those responsible for your injuries accountable. 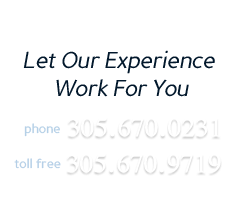 If you have any questions please contact our firm. All initial consultations are free of charge.